Wood is a building material derived from a renewable resource. It is completely biodegradable, serves as a great insulator and uses less energy to process than many other building materials. Wood is also strong, lightweight, flexible, affordable, beautiful, and retains carbon. Taking into account the detrimental effects of using non renewable resources such as coal and oil, the importance of using natural and renewable resources cannot be overstated. Cross Laminated Timber (CLT) also commonly known as a solid wood board is a massive wood building material consisting of bonded, cross-laminated single layers called lamellas. CLT boards are normally produced from dried spruce lamellas which are stacked together at right angles and glued over the entirety of their surface. Each layer of boards is placed crosswise to the adjacent layer for increased rigidity and stability. The CLT board can have three to seven layers, or more, normally in odd numbers, symmetrical around the mid layer. This solid wood building system consists of ready to use building components which are assembled to form complete frameworks. Dimensional lumber is the main input material and while softwoods dominate CLT can also be manufactured using hardwoods like poplar or even hybrid panels such as OSB, LSL, OSL and LVL. CLT panels are factory produced with high precision CNC (Computer Numerically Controlled) machines providing for high dimensional accuracy. CLT presents new opportunities for wood in non-traditional applications. It is currently being prospected as an alternative to traditional structural frame methods such as steel, concrete and masonry. CLT is so strong, earthquake and fire-proof that it can be used as a substitute for concrete in high-rise buildings up to 12 floors. 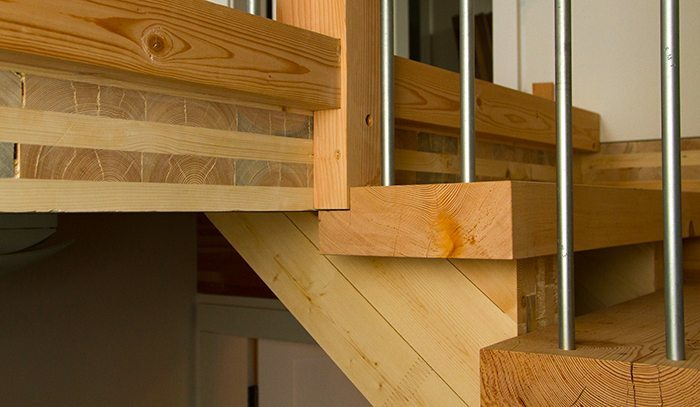 The crossways arrangement of the longitudinal and crosswise laminates found in CLT reduces the swelling and shrinkage in the board plane making for a building component that is dimensionally stable and resistant to warping. Any weakness in the individual stick of lumber is cancelled out by the cross lamination with other pieces until there is a single timber board with uniform strength properties closer to reinforced concrete than wood. Gluing at high pressure makes CLT a rigid structural timber member that can be used both vertically and horizontally to construct a buildings frame. CLT panels possess relatively high in plane or seismic and out of plane (wind) strength and stiffness properties. Because massive wood is lighter than concrete, the building’s weight does not amplify the shaking. Notably, in recent years, six- and seven-storey massive wood buildings have been tested on the world’s largest shaking table in Japan at simulations of magnitude 7.5 earthquakes and have shown almost no damage. The high strength-to-weight properties decrease the seismic forces acting against the structure, making these buildings extremely safe while simultaneously allowing for smaller foundations. Given that wood burns, most people assume that it behaves poorly in fires. Massive wood is however much more fire-resistant than is perceived; large size wood members have the inherent ability to provide fire resistance because of the unique charring properties of wood. The surface charring protects the inner layers of the CLT so that in a fire, a massive wood construction will char but will not collapse unlike what could happen to buildings constructed from steel or concrete. Solid wood boards give excellent acoustic insulation. The acoustical performance of CLT has been rated as sound class B and A in Europe. CLT construction gives the building an airtight enclosure of solid mass elements, and with the proper design can satisfy the strictest acoustic ratings even in multi-storey residential buildings. CLT walls will absorb a large amount of energy before releasing it into the atmosphere on the other side of the wall providing good heat insulation. Natural timber is a climate regulating water vapour buffer; CLT ensures a healthy and comfortable room climate. The optimal healthy indoor air humidity is 30–55%. The more massive wood used in the inner walls of a building, the better indoor humidity remains at a level optimal for health. CLT’s versatility comes from the fact that boards can be used for all assemblies just by varying the thickness. It is, additionally, perfectly combinable with other construction materials and its load distribution properties enable the highest possible freedom in architectural implementation. Even more, the accuracy of CNC ensures an architecturally pleasing result. Building with this material translates to a shorter erection time due to the prefabricated elements; no curing time is needed. There is less demand for skilled construction labor where erection of a structure using CLT will mostly require carpentry skills and power tools. Erecting the shell of an entire house can take as little as 8 hours and crews of 2, 4 or 8 carpenters plus one or two mobile crane operators are adequate for a project. This lowers capital costs, provides for faster project turnaround and potential insurance benefits. Also, little waste is produced in as far as wet trades are eliminated. No separate wind barrier is needed as structures built with this material are air and wind tight. On the whole, CLT is said to have a lighter environmental footprint than non-wood materials due to its low embodied energy per weight. Massive wood acts as a carbon sink during its entire lifetime – helping to mitigate climate change. 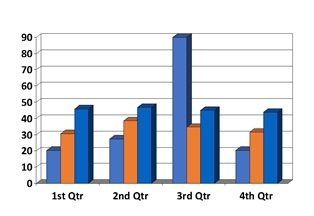 CLT is by far the most ecological building material – energy consumption in the industrial production of CLTs is equivalent to one third for producing equivalent elements in some other materials. These sustainable properties allow CLT buildings to save more carbon than their tenants would use in the occupation of the building for subsequent decades. CLT can be innovatively applied as a massive building system for single and multi family residential buildings, multi storey residential and commercial buildings, buildings for business and industry, and for special applications in structural timber constructions. It is also commonly applied for external and internal walls, ceilings and roofs. In the construction of bridges CLT is used for decking. One of Europe’s leading wood product manufacturers, Stora Enso Building Solutions, has introduced a new advanced integrated system Urban MultiStorey™ concept for the construction of offices, residential, public and commercial buildings with CLT at its core. The prefabricated CLT elements are delivered to the site with integrated windows, doors, insulation and exterior wall finishes completed in the factories according to the architectural plan. The Urban MultiStorey™ concept has, in addition, been specially developed to provide a technical solution for designing buildings that can achieve a smaller carbon footprint with the minimum energy usage. The Urban MultiStorey™ Concept takes advantage of CLT’s sustainability, cost-effectiveness and innovativeness as a building material. Buildings built with this concept will be unique, long-lasting, fire-safe and acoustically pleasing facilities.